FARMINGTON HILLS, Mich. – (Nov. 16, 2016) – CCE, a leading provider of advanced CAD interoperability technology, announced significant updates to its Open Data eXchange (ODX) libraries with support for NX 11.0 data. The latest ODX library for NX includes support for convergent bodies introduced in NX 11.0. Convergent Modeling is breakthrough technology introduced in NX 11.0 that allows designers to work directly with facets, surfaces and solids all at once, without the need for any data conversion. This new modeling paradigm has a lot of application in the medical industry, especially when working with scanned data for designing implants. "Convergent Modeling is a very exciting technology introduced recently by Siemens in its NX 11.0 release. 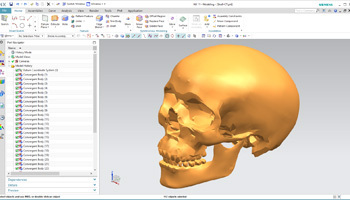 It not only helps working efficiently with scanned data in a designer’s modeling environment, as is seen very commonly in the medical industry for designing cranial or dental implants, but also optimizes product design to support 3D printing and additive manufacturing. CCE continues its commitment to keep pace with CAD updates and provide its ISV customers the ability to support convergent modeling data in their own application within months of the release of NX 11.0,” said Vinay Wagle, CCE's Vice President of Sales and Marketing. CCE has also enhanced NX export capabilities in its ODX libraries with the ability to create parts with Parasolid compound bodies in addition to solid and sheet bodies. To learn more about CCE’s CAD interoperability libraries, visit – http://www.cadcam-e.com/development-tools/development-tools.aspx.